In English grammar and morphology a prefix is a letter or set of letters that are added to the beginning of a root word in order to create a new word with a diverse meaning. For example, when the prefix ‘dis’ is added to the word appear, it gives birth to a brand new word ‘disappear’. 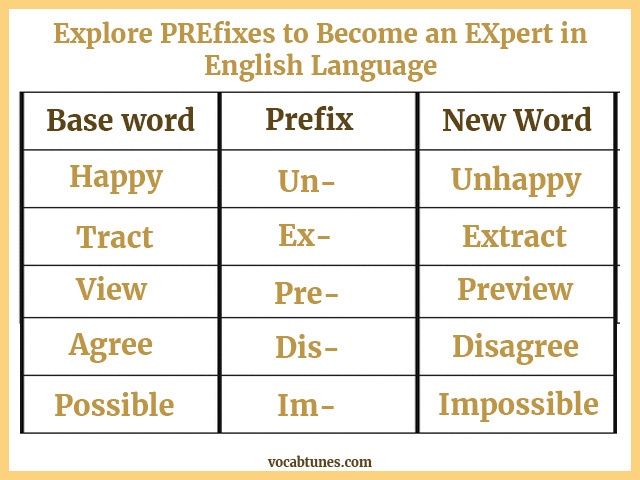 Interestingly enough, the word prefix itself contains the prefix “pre-” which means ‘before’ and the root word ‘fix’ which means ‘to place’, thus the word itself means “to place before.” Prefixes are bound morphemes, which mean they can’t stand alone. Generally, if a cluster of letters is a prefix, it can’t also be a word. However, the process of placing a prefix to a word, or prefixation, is a common tactic of forming new words in English Language. Prefixes can be either derivational, creating a new word with a new semantic meaning, or inflectional, creating a new form of the word with the same basic meaning. Particularly in the study of languages, prefix is also called as preformative, because it alters the form of the word parts to which it is affixed. Take a look at the list of common prefixes given below. To make you understand this in a fun way, Vocab Tunes, an accelerated vocabulary building platform, has come up with a brilliant idea to introduce your young ones to the world of prefixes with the help of its educative song ‘Prefixes’. So, what are you waiting for? Let’s hear this song and discover multiple words using prefixes such as Disapart, Ingest, Intervene, Dismantle, Extend, and many more. Apart from this song, the program also lists 20 more songs pertaining to different root words and suffixes that will help you to enrich your vocabulary.